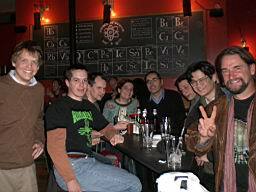 From late 2005 until some time in 2009, a social group met in Cambridge, Massachusetts and later Silicon Valley to discuss the creation of life. Picture a drinking club for wannabe Dr. Frankensteins with a severe case of nerd, and you're pretty close. The original Grey Thumb Boston was founded by (in no particular order) Adam Ierymenko, Brian Peltonen, Chuck Lewin, Jonathan Klein, and others. If your name is missing and you want it here, e-mail me. Later a Silicon Valley chapter was created by Bruce Damer, who also attended a few of the Boston meetings when he happened to be on the right coast. What brought these folks together was a shared interest in artificial life, a small and aggressively interdisciplinary field of study that brings together ideas from biology, computer science, mathematics, physics, and even philosophy to attempt to study and even create "life as it could be." Most of the early work in the field was computational, with Tierra being widely regarded as the first true attempt to simulate open-ended evolution in a computer. In the past decade some work has been done to attempt to create life in actual biochemical media, with most of this work coming under the related heading of synthetic biology. Major related areas of study include cellular automata, complex systems, chaos, thermodynamics, economics, game theory, and combinatorics, to name just a few. The name Grey Thumb was a play on "green thumb," referring to skill at making synthetic ("grey") things grow. As for why anyone would want to do this the reasons vary from just tinkering, to harnessing of evolutionary processes to create artificial intelligence, to the quest to define life in a medium-independent way. Dr. Christoph Adami of Michigan State University was among those who worked with early computational artificial life (though he never attended Grey Thumb), and his TED talk entitled Finding Life We Can't Imagine deals with the sorts of questions that might be answered with simulated (?) living systems. Grey Thumb Boston met monthly across most of its life span, first at a small bar and restaurant in Central Square in Cambridge and then later at a larger venue close to MIT. At its peak it boasted almost a hundred attendees at some meetings. It brought together people as diverse as students and professors, computer hackers and IT professionals, financial quants and economists, authors, journalists, philosophers, and even folks with no related technical background but who just found the ideas cool. Like many such things, it eventually came to an end -- though I've heard rumors of attempts to reactivate chapters in New York City and the San Francisco / Silicon Valley area. A few years after the last meeting I let the domain lapse and it got gobbled up by a so-called "portal pottie," one of those fake spam-portals run by domain squatters. In the last year or two I've thought about it from time to time and regretted letting its Internet presence fade. A week or so ago I checked the domain on a whim and... nothing! I did a WHOIS and e-mailed the domain's owner. He'd let the domain lapse as well, so I paid him the ransom required to wrench it from the filthy drooling maw of GoDaddy and its "lapsed domain process" or whatever it's called. A few days later I got an e-mail: "domain transfer complete," and now here we are. What follows is as much surviving material as I've been able to find. Thanks to YouTube most of the lectures that were recorded are still available, and many of the projects created by Grey Thumb participants are still online as well. If you have something you'd like to add, drop me a line! If anyone has a project, site, video, or anything else, by all means let me know and I'll add it!